You can fill out an adoption application online on our official website.Sweet AffectionateMy name is Pru. 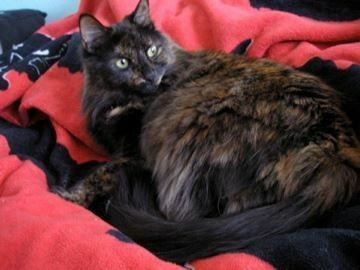 I'm a long hair tortoiseshell kitty, Indoor only, spayed. I'm a sweet girl and give and receive lots of attention. If you are interested in adopting me, please contact Gina at gmartinezsj@yahoo.com THIS animal listing is a COURTESY LISTING - not a 13th St Cat Rescue animal. See information about whom to contact in bio THANK YOUVisit this organization's web site to see any additional information available about this pet.